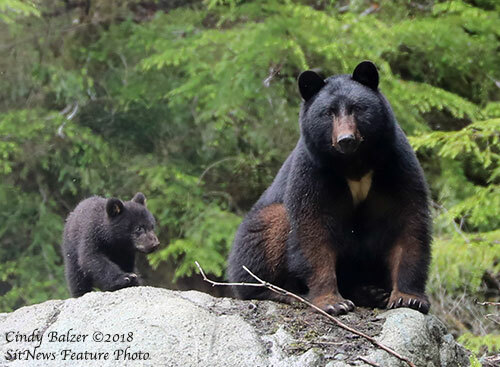 Momma bear is very attentive and protective of her new little cub at Herring Cove. According to Alaska Department of Fish & Game, "Bears tend to be solitary animals except for females with cubs. Bear cubs are born mid-winter, tiny and blind, and nurse through the winter sharing their mother’s fat reserves through her rich milk. A female will typically have two or three cubs, and they will stay with her until heading out on their own as two-year-olds. Mother bears are fiercely protective of their cubs." Ketchikan: Ken C. Eichner Healing Garden Ribbon Cutting Wednesday - Ken Eichner was an aviation pioneer who was instrumental in navigating the direction of Ketchikan in the twentieth century. 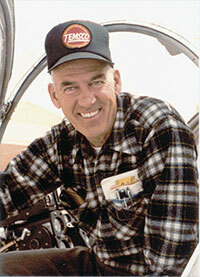 The co-founder of both the Ketchikan Volunteer Rescue Squad and TEMSCO Helicopters, he died at the age of 88 in 2007. His legacy will continue with the opening of the Ken C. Eichner Healing Garden at PeaceHealth Ketchikan Wednesday. The garden is an outgrowth of the Eichner family’s generosity. The gift they made in his memory in 2014 is the largest private donation made to the Ketchikan Medical Center Foundation. Everyone is invited to the grand opening celebration Wednesday, June 06, at 12:30 for the ribbon cutting ceremony followed by lunch with the Eichner family. Elements of Eichner’s career are included in the garden. Helicopter blades and parts are incorporated into the design along with native plants and flowers and seating which will include benches and chairs and tables. Daniel added, “We also have a 40’ international offshore racing boat from the 80’s (Superfriends), a team trying to be the first to complete the race by pedal power alone (Take me to the Volcano), 2 teams returning (PT Watercraft and Trak Kayaks) are trying to beat the world records they set for fastest solo and fastest kayak with no sail and another Stand up Paddler (Torrent) who is using the race to fuel a documentary to raise awareness about Traumatic Brain Injury and PTSD in veterans. There is no end to the stories this year. And the tracker is a good place to start.The tracker is a free to view map that allows online viewers to follow each team and even connects viewers to team social media pages. Daniel and the media film crew will follow the race on a variety of power boats recording and interviewing the teams as they find their own way to make it to Ketchikan. Alaska: Scientists find pre-earthquake activity in central Alaska By FRITZ FREUDENBERGER - Earth scientists consistently look for a reliable way to forecast earthquakes. New research from University of Alaska Fairbanks Geophysical Institute professor Carl Tape may help in that endeavor, due to a unique set of circumstances. A second, similar event in 2016 led to a key observation. At Minto Flats, a magnitude 3.7 quake occurred at a depth of about 10.5 miles, not an unusual event in itself. However, the event was preceded by a 12-hour accelerating sequence of earthquakes and 22 seconds of distinct high- and low-frequency waves in a concentrated area. MONEY MATTERS: FINANCE 101 FOR WIDOWS By MARY LYNNE DAHL, CFP® - Financial problems are common at all ages, for both sexes and across all income groups of people. Widowhood is difficult for everybody, but for some women, it creates a major stumbling block over making necessary financial decisions she may not be qualified to make. This does not have to be that way, however. Widowhood brings a new perspective on money to many women. While men have concerns, too, they have demonstrated less stress over the financial aspects of widowhood as compared to women, statistically. For whatever reasons, more women than men report being fearful and apprehensive of making the necessary and sometimes new financial decisions they face as a result of being widowed. The big issue for most women, especially those who have stayed at home, raised their children and remained out of the workforce, are having a reliable and adequate source of income. The easiest and least expensive solution to this problem is life insurance on the wage earner, oftentimes through an inexpensive policy purchased through the employer. It is generally accepted that the amount should be enough to produce income to support the family at least until all the children are grown and educated, but I have observed that employer policies may not offer enough to meet this need. If that is the case, an inexpensive term life policy can be purchased to provide the additional amount needed. Many women report, however, that they do not know if their deceased husband did, in fact, have any life insurance, either through his employer or additionally through a privately purchased policy. Sometimes they do know, but are unaware of the cost, the death benefit or how to access this much needed insurance. I recall speaking with a woman one time who had been widowed about 7 months earlier and was still paying the premiums on her deceased husband’s life insurance policy. When I showed surprise at this and asked her why she was paying the premiums, her reply was that it was “a bill, and I pay all the bills as soon as they come in.” I gently informed her, of course, that she should notify the company of her husband’s death, stop paying premiums and collect the death benefit was now hers, tax-free. She was a little embarrassed but got on with making even more financial decisions after that. 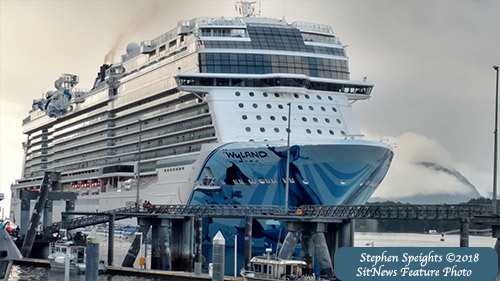 Norwegian Bliss is one of the largest ships to sail in Alaskan waters making her debue in Ketchikan Monday - June 4th. Norwegian Bliss has 20 decks, 2,038 staterooms and capacity for 4,000 passengers. DAVE KIFFER: It's a bird, it's a plane, it's megaship!! - OMG, a cruise ship blocked out the sun this week! Yeah, yeah, I get that everything blocks out the sun in Our Fair Salmon City. Which reminds me that once upon a time, one of my smarty pants cousins from Seattle said that Ketchikan must be on Venus because it is always covered in clouds. At least our atmosphere is not full of sulfuric acid and other modern pollutants like Seattle, I responded, showing off my impeccable grasp of Venusian meteorology. Of course, that was before the atmosphere of Seattle became 97.8 percent cannabis smoke. Oh, did I just say that? Anyway, a cruise ship blocked the sun in Ketchikan this week. It was an amazing astronomical event. One in which hundreds of Ketchikan residents immediately went outside their abodes and raised their cell phones to the sky to snap pictures of said nautical/celestial event. For all we have, we owe thanks By Rep. Dan Ortiz - Last week I had the honor and privilege of attending the Kayhi Scholarship Awards assembly at the Ketchikan High School Auditorium. More than 6 million dollars in scholarships were offered to the Kayhi graduating class of 2018 and more than 3 million dollars were accepted. This is evidence of the hard work put forth by the students who were able to qualify for these scholarships and educational opportunities. It is also evidence of the ready support of their families, teachers, counselors, coaches, and the entire community of Ketchikan. Let’s make Alaska home of the next big idea By Sen. Lisa Murkowski and Energy Secretary Rick Perry - Over the next few days, the University of Alaska will host a unique event that brings dozens of the world’s best and brightest scientists to Fairbanks. Known as National Lab Day, this forum will provide an incredible opportunity for Alaskans to form new partnerships with the individuals who run our nation’s premier research institutions. The Stand for Salmon Deception By Curtis Thayer - The Alaska Chamber has long been an outspoken voice for pro-business policies that grow our economy and create economic opportunities for Alaskans. For several years, especially during the recent economic slump, we’ve advocated for a state fiscal plan that limits government spending and supports private sector growth. Ketchikan Taxpayers & Assembly/School Board – or – The Ant and Grasshopper By Dan Bockhorst - In Delphi, Greece around 582 BC, Aesop narrated a fable of a grasshopper that spent the summer frolicking while an ant gathered food for the coming winter. When winter arrived, the grasshopper didn’t have enough to eat and begged the ant for food. The ant reminded the grasshopper of its failure to prepare for lean times and told it to frolic elsewhere. Open Letter RE Community Grants: KGB Mayor Landis By Glen Thompson - Dear Mayor Landis, At the Regular Assembly Meeting of May 7, 2018, the Ketchikan Gateway Borough Assembly (“Assembly”) introduced Ordinance 1859, adopting the FY2019 Borough Budget, and set that ordinance for public hearing at the Regular Assembly Meeting of May 21, 2018. 2020 GO TO HELL, DOT By David G Hanger - While Juneau gets pristine roads without a pothole anywhere, Ketchikan gets a damned dog and pony show put on by DOT that includes toy trucks and hard hats for the kids. Plus the announcement that no improvements will be made to that hole in the road between the Coast Guard base and Saxman for at least three years. How much of this is racist????!!! Saxman is, of course, an Indian community. 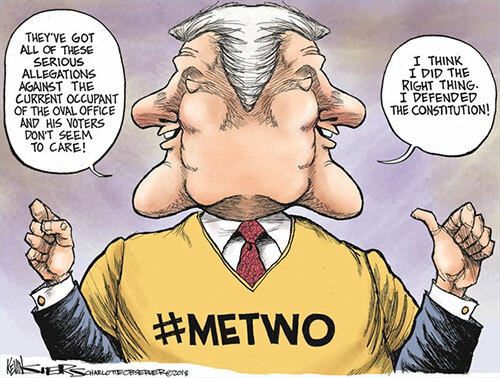 HB 312 strips away your rights By Andree McLeod - Lawmakers have again willfully and intentionally stripped away constitutionally protected rights of due process. House Bill 312 is, in part, an Act relating to arrest without a warrant for assault in the fourth degree at a health care facility. It impacts everyone, especially people who live with brain illness and cognitive impairments, such as autism, Post-Traumatic Stress Disorder, dementia, Alzheimer's disease, Traumatic Brain Injury, and mental illness, among other brain illness.